The World Federation for Mental Health and the French Psychiatrist Partners have joined together to organize the first edition of the international congress: MENTAL HEALTH FOR ALL. The congress will take place at Lille Grand Palais, France, from 28 to 30 April 2015. 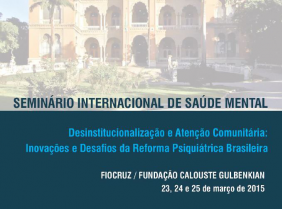 The Oswaldo Cruz Foundation (Fiocruz) and the Gulbenkian Global Mental Health Platform organized an international seminar to discuss the innovations and challenges of the Brazilian Psychiatric Reform. The seminar was held on the 23rd, 24th and 25th March, 2015, in Rio de Janeiro, with the active collaboration of the World Health Organization, the Pan American Health Organization and the Ministry of Health of Brazil. The International Association for Suicide Prevention has created the De Leo Fund Award, offered to distinguished scholars in recognition of their outstanding research on suicidal behaviours carried out in developing countries. The European Congress of the World Association for Psychosocial Rehabilitation, organized by the Italian Branch of the WAPR, will be held on 15-16 May 2015 in Turin, Italy. TheMHS Conference 2015 will be held in Canberra to celebrate the 25th Anniversary of TheMHS Conference: Translating Best Practice into Reality.